Why was he unable to see Jesus? What does he do to overcome this obstacle? What were Jesus' first words to Zacchaeus? Finally, on your journey toward Sunday, ponder one last question: "When was the last time I put forth a great deal of effort to be with Jesus?" Our worship this Sunday will include the celebration of All Saints' Day. Come, let us worship our Lord and give thanks for those who, while they walked the earth, enriched our lives in endless ways. In preparation for worship this Sunday, read Luke 18:9-14. In this reading, to whom is Jesus speaking? What is the prayer of the Pharisee? In contrast, what is the prayer of the tax collector? May the following excerpt from Albert Nolan's book, Jesus Before Christianity: The Gospel of Liberation help you imagine the radical nature of Jesus' teaching in this parable. It is difficult for us to imagine the shock with which the parable of the publican and the Pharisee must have been received. 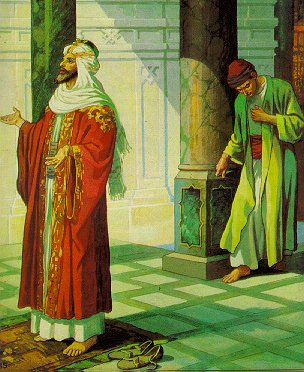 The Pharisee is depicted as an exemplary man of religion. He does even more than is required of him by law: he fasts twice a week. There is no suggestion that he was a hypocrite. He does not take the credit for his own virtue; he thanks God for it. The publican or tax collector, on the other hand, although he asks God for mercy, makes no attempt to mend his ways and to make restitution for all the money he has [likely] stolen. I find it particularly interesting that in the end, both the Pharisee and the tax collector were in need of the same thing but in different ways and for different reasons. What they both needed most was the love of Jesus. As always, I look forward to worshiping with you this Sunday. Until then, may the Lord bless you and those you love. 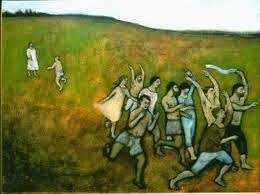 In worship this Sunday, we will look carefully at Luke 11:1-13. The first section of this reading is Jesus' response to a request from the disciples, "Lord, teach us to pray." In the second section Jesus provides an example of persistent prayer. Take some time to sit quietly with the text, reading it through at least twice. During the first read-through, you might simply note what intrigues you most. During the second reading, you might try to put yourself in the story, perhaps as one of the disciples or as the friend who is seeking bread for an unexpected guest. How do you hear Jesus' teaching from this point of view? Someone else has been teaching his disciples how to pray. Who? How does Jesus' model prayer begin? What other components are present in the prayer? Why does the man go to his friend's house at midnight? What is the result of the man's persistence? What "good gifts" do you seek from the Father's generous hand? How persistent are you? As you journey toward Sunday, may the Lord bless you and those whom you love. In preparation for worship this Sunday, read through Luke 17:11-19 two or three times, slowly and prayerfully. Who are the main characters? What intrigues you most? In your own faith walk, when have you cried out to the Lord, "Jesus, Master, have mercy on me!"? When have you bowed before the Lord with a cry of thanksgiving? reach the fears and darkness of our world. mental illness, disfigurement and the approach of death. because they offend our competitive society. grim illness and all that threatens life. and may have it in all its fullness. As you journey toward Sunday, may the Lord richly bless you and those whom you love. [i] Bernard Thorogood, in A Restless Hope: Prayer Handbook 1995. In preparation for worship, read Luke 17:5-10. What strikes you as most important about this passage? Take time to read it a second time, paying particular attention to what happens around the "table." Sunday, October 6 is World Communion Sunday. In light of our celebration, I invite you to meditate on the following blessing written by Jan Richardson. As you journey toward Sunday, may you be blessed by the warm rays of the sun and the sure knowledge of God's embrace.